The oldest surviving medical text is the Chinese Huangdi Neijing (or the Yellow Emperor's Inner Canon). It describes the body's supposed system of interconnected channels or meridians through which flows qi (pronounced "chee"), the "vital energy." The meridians are believed to approach the surface of the body at specific points, called xue, where the qi can be re-routed or altered either by inserting needles, applying pressure, or burning pellets of vegetable fiber just above the points. Western science has not confirmed the theories upon which acupuncture is based, nor has it found a verifiable explanation for the touted cures and benefits. Indeed, the beneficial effects of acupuncture may be only those of suggestion, distraction, and other psychological effects. It is well known that expectation can help produce benefits (the placebo effect) and that distraction and suggestion can have an analgesic (pain-relieving) effect. This acupuncture body model, imported from China, maps the myriad acu-points and meridians used in this system of medicine. 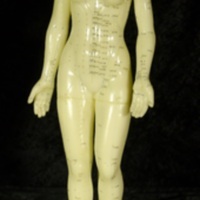 “Acupuncture Body Model,” The Skeptiseum, accessed April 19, 2019, http://skeptiseum.org/items/show/98.